My friend Robbie Payne, who writes Robbie's Paw Prints, sent me this great review of her favorite local bead store (LBS). Keep 'em coming, folks! And if you'd like to read about other stores that readers have recommended in the past, just click on the category LBS. I've been shopping at this bead shop since I found it several years ago and I've posted about it often on my blog. In fact, I've even called and have them ship beads to me when I'm back in Michigan! I know they'll have the beads I want and they were more than happy to accommodate. The shop is now under a new owner and she's filling the shop with even more beads and beading supplies! They too are wonderful to work with and seem more than happy to order something special a customer might want or need! 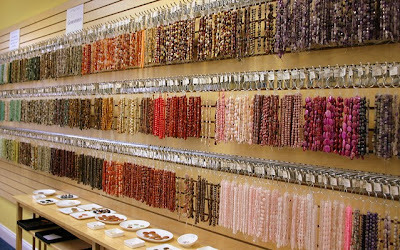 I've never shopped at a bead store that has such a large selection of colors and sizes in Delicas (of course my favorite! ), semi-precious gemstones, Japanese seed beads, Swarovski crystals, and so much more! It's a beader's delight experience for sure!!! Thanks for this review...I'm a few hours from Ocala, but it sounds as if it would be well worth the trip.